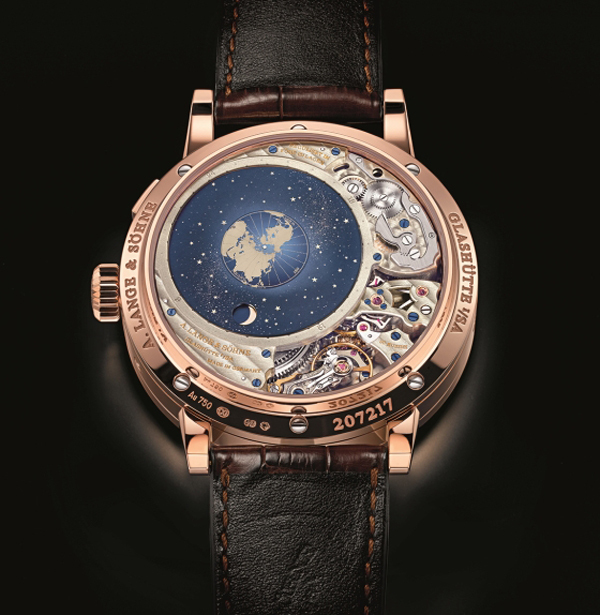 As promised yesterday, we focus on astronomy this week- with some of the most scintillating timepieces coming out of SIHH 2014 in Geneva recently. 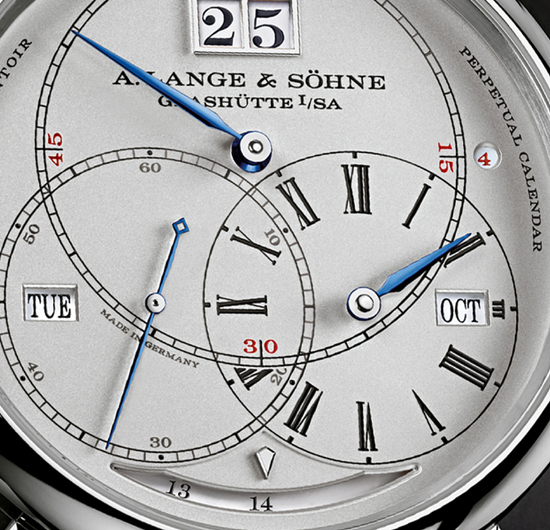 Among them—the absolute must-have A. Lange &Sohne Richard Lange Perpetual Calendar Terraluna. Intriguing, alluring and complex, this watch demonstrates better than most how influential the moon’s lure is over man – once you see, touch, feel this watch – it will be on your hot list. The regulator style dial packs so much information into it, yet is clean, crisp and elegant. Before we launch into the to-the-moon technical details of this watch — we want to let you know a few intriguing facts: The orbital moon display will not need a day correction for more than 40 generations (1,058 years to be exact); The watch features a world-first cam storage of power for low-energy switching of information at midnight;Valued at lss than the cost of a house — it was more than 3 yeras in the making. The watch offers 14 days of power reserve thanks to twin barrels, and has a constant force escapement. The regulator style dial of the perpetual calendar watch is in and of itself a beauty; but when you add to that the complex watch back – with orbital moonphase indicator that is the brand’s most precise tracker to date – the watch just works its magic. 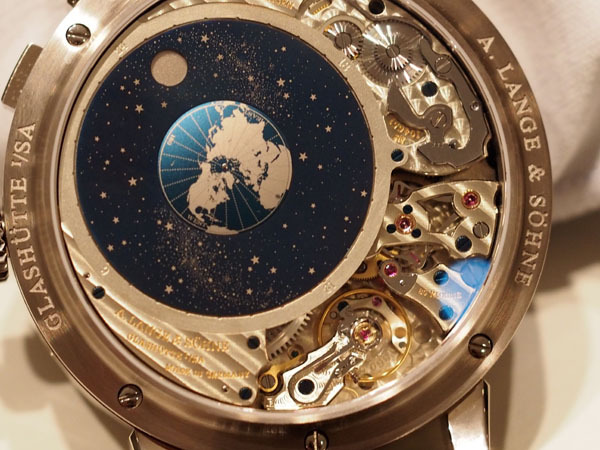 The watch – explained in the video below — offers a stunning orbital moonphase complication on the mainplate of the movement – visible via the caseback. Equipped with the Calibre L096, the watch features a constant force escapement (ensuring consistent energy is sent out every 10 seconds). The Richard Lange Perpetual Calendar Terraluna was several years in the making and houses the brand’s proprietary Caliber L096. A big, bold, beautiful brut, this 45.5mm watch displays on the dial the minutes as the largest of the readouts in a subdial at the top, the hours are at the right with Roman numerals, and the interlocking seconds subdial harmoniously balances the regulator look. The watch features the large Lange big date readout at 12:00, and set neatly into each of the hour and seconds subdials is the month on the right and the day of week on the left. The leap year indicator is discreetly placed at about 2:30 and the incredible 14-dya power reserve indicator (made possible via twin barrels) is visible via an arc aperture spanning from 5:00 to 7:00 on the dial. In all, the information-packed dial is clean, crisp, easy to read and beautiful to look at. Making the watch even more alluring is the fact that all of the displays that should change switch instantaneously at midnight thanks to a cam device that stores the power for switching during the dayt. 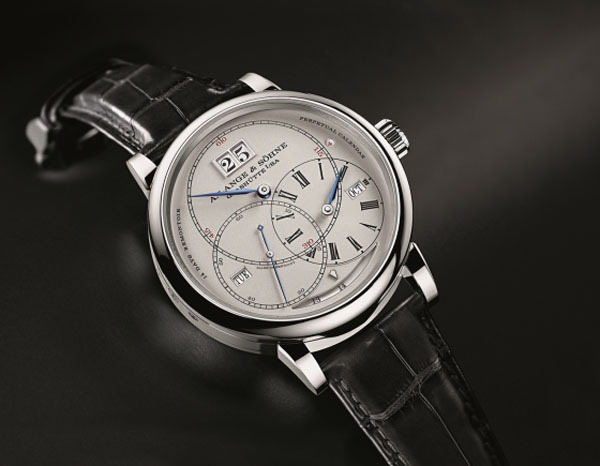 According to A. Lange & Sohne this is a world first in a wristwatch. Like all A. Lange &Sohne calibers, every piece of the movement is exquisitely finished. While the dial is beautiful, balanced and elegant, it is the back of the watch that will have you drooling. 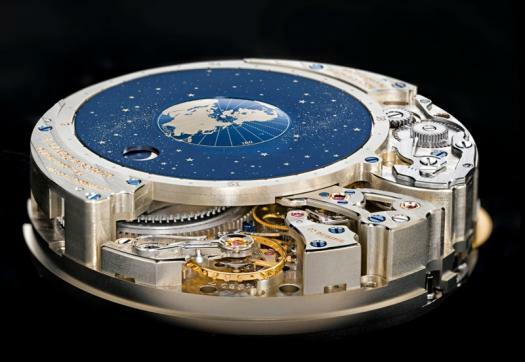 It offers the orbital moonphase display via three separate disks: one each for the moon, sky and Earth. The earth, in the center, is surrounded by a celestial sky disk with more than 2000 stars on it. The position of the sun is demonstrated by the balance wheel. The moonphase aperture orbits the earth once a lunar month (29 days, 12 hours, 44minutse and 3 seconds) and is so precise that it will not need to be corrected by a day for 1,058 years. The complex caliber takes quite some time to build, and so production will be limited. As to the price, it is created in both 18-karat pink gold and white gold, and retails for $229,200 and $230,400 respectively. Not a bad price for a moonphase watch that will be accurate for more than 40 generations before needing an adjustment — but don’t take my word for it, view the video below.